A few months after Nate moved to Washington D.C., his friend Stephanie asked if he was single. Nate told her, “If you mean being-out-on-the-town single, then no; but, if you mean work-crazy-hours-and-have-leftover-spaghetti-for-dinner single then yes, I was very single.” Stephanie set Nate up with Katherine Johnson, a Wellesley College alum and Harvard Law grad, who—like Nate—was working for the Obama Administration at the White House. Katie was a regulatory lawyer in the budget office and Nate was a policy advisor and speechwriter at the State Department. For their first date, “a freezing January night,” Nate picked a nice bar in Katie’s neighborhood, and “neither of us shut-up for two and a half hours,” he says. They continued dating for the next 10 months, while Nate got a new job as a speechwriter for then-Vice President Joe Biden. “Katie and I had offices at opposite ends of a long hallway, and all of our friends joked that I followed her and invaded her turf,” Nate says. By Thanksgiving, Nate was ready to propose. Unfortunately, the engagement ring he chose took jewelers seven months to make. “I’m sure my in-laws were wondering what the heck was taking me so long, but in the end the ring was perfect,” he says. Nate popped the question in a park near Katie’s house before taking his new bride-to-be to the Peruvian restaurant where they had their first “real” date. While at dinner, the couple’s best friends snuck into their house (pre-arranged by Nate), lit candles, and put a bottle of champagne on ice for their return home. Dinner took much longer than expected, and when they returned home the candles had burned all the way down, leaving permanent marks on their mantel to remind them of the night they got engaged. When it came to the wedding venue, Katie knew that she wanted to get married at her family home, just as her mother did. So, the couple kicked off their Memorial Day Weekend wedding celebration with an intimate welcome dinner for the family and bridal party at Brookline’s Washington Square Tavern, a favorite neighborhood spot of the bride’s family. On Saturday, in lieu of a traditional rehearsal dinner, the couple—along with their families, guests, and the wedding party—boarded the ferry to Thompson Island for a BBQ and an “epic game of capture the flag,” Nate says, complete with trophies, colorful headbands, and a bottle of Tennessee whisky (a token from Nates’s home state) for the winner. 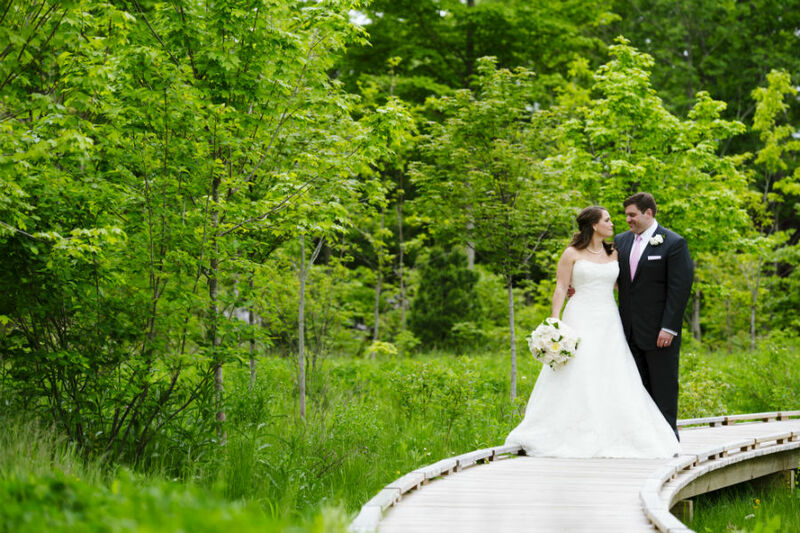 The next day, the couple held a tented reception at Katie’s parents’ home, making use of the property’s lush gardens. Lo McShay, the couple’s event designer, chose not to put a floor in the tent, channeling Katie’s vision of a relaxed “midnight garden.” For food, Nate and Katie opted for a family-style dinner served on vintage platters. New York-based band 45 Riots played ’70s funk until 11 p.m., while a silent disco and late-night port wine, ice cream sandwiches, and burgers rounded out the evening. 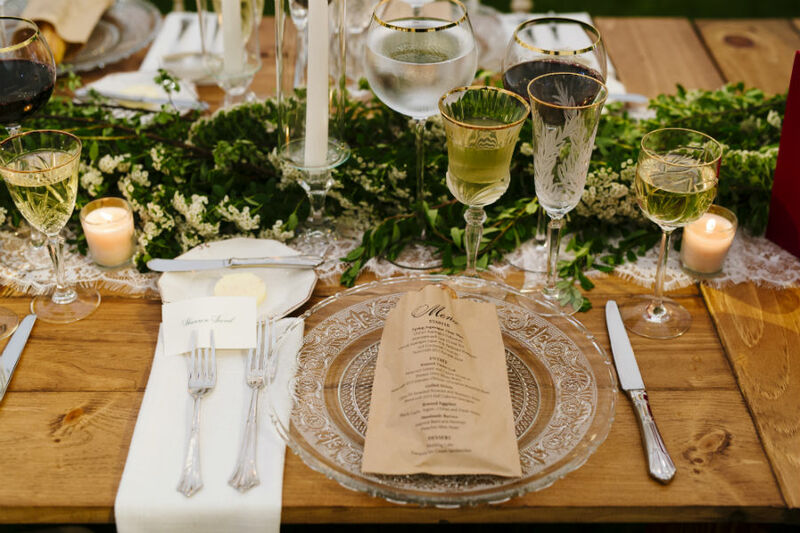 Mix-and-match glasswear, plates, and platters by Borrowed BLU decorated the tables, creating a vintage garden-party feel. 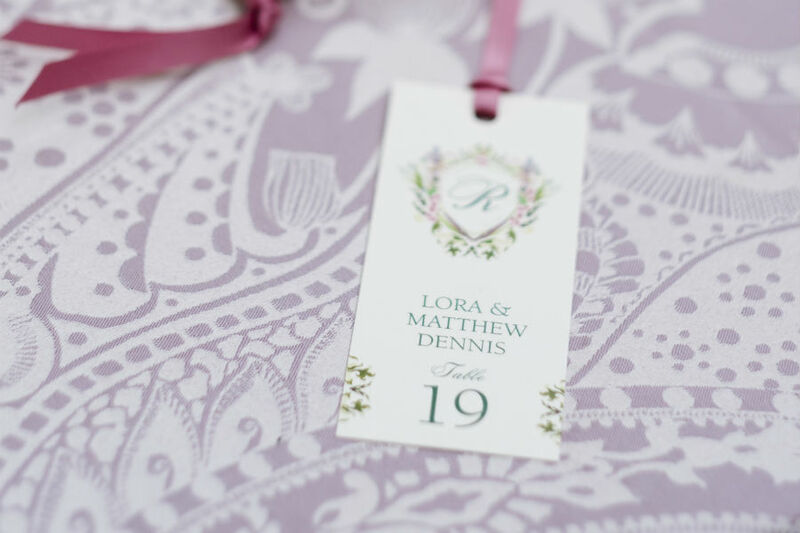 Momental Designs dreamed up a family crest for the couple, using it as a cohesive design element on the invitations, the dinner napkins, the throw pillows, the bookmarks, and the wedding program. 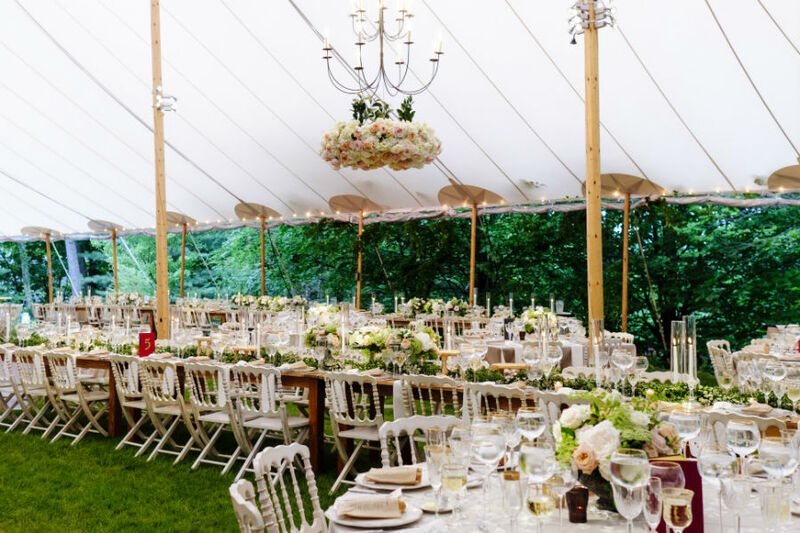 In keeping with Katie’s Victorian family home, French-inspired wrought-iron chandeliers adorned with hanging floral arrangements cast a rose-colored hue on the tent’s whitewashed vintage chairs. In honor of Nate’s mother—“a librarian, a first amendment fundamentalist, and a voracious reader of banned books,” he says—the couple named each of the dinner tables after banned books such as Catcher in the Rye and I Know Why the Caged Bird Sings. 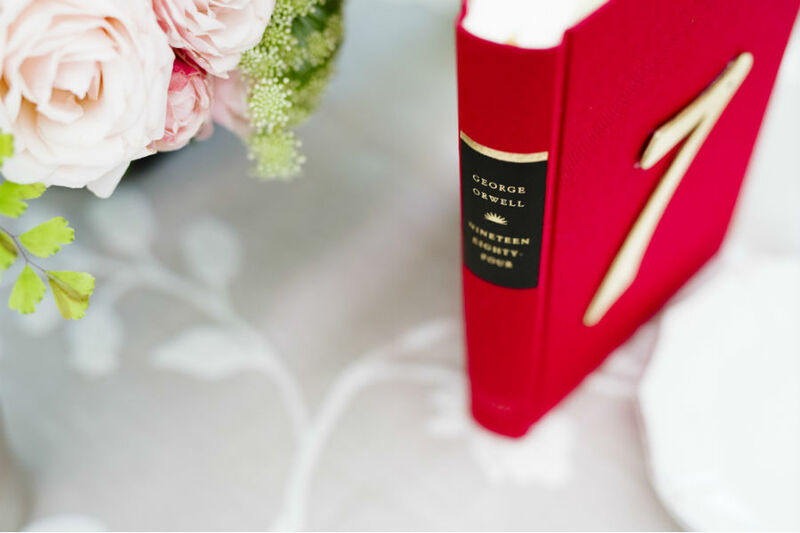 They placed vintage copies of the books on the tables with beautiful bookmarks that explained their meaning. 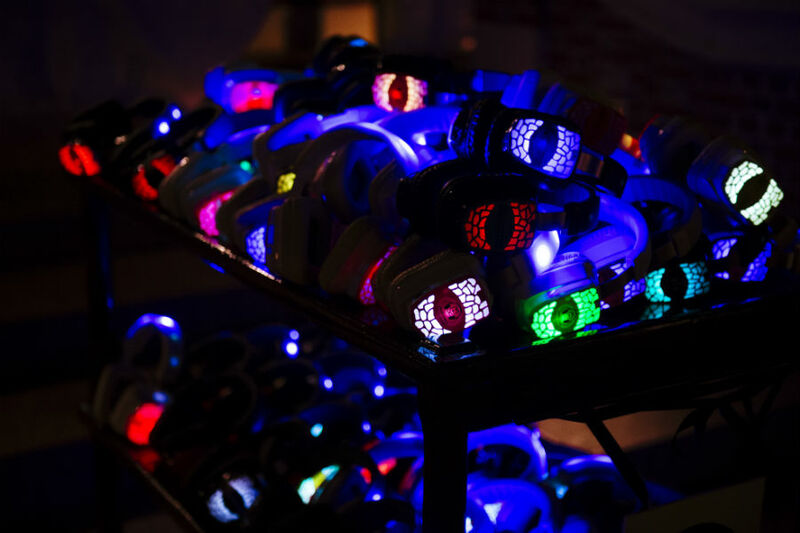 Katie and Nate didn’t let an 11 p.m. noise ordinance stop the party: Thanks to a “Silent Disco” where guests donned neon headphones, the festivities continued into the night.